Despite occasional attacks, signs point to Hamas interest in maintaining quiet in Gaza, analyst says. Despite occasional rocket attacks in recent weeks, signs point to Hamas seeking quiet in Gaza for the foreseeable future, according to Arutz Sheva analyst Kobi Finkler. The latest evidence is the quiet that followed Israel’s assassination of a senior Gaza terrorist. The IAF killed terrorist weapons expert Haitham Ziyad al-Mishal in a rocket strike. While previous such operations have been met with Hamas threats and instant rocket attacks, Mishal’s death passed in relative silence. Another sign of Hamas’ plans is its transfer of many members of its armed forces from the front lines of anti-Israel terrorism to internal enforcement of Hamas rule. Hamas members are increasingly sent to shut down demonstrations in Gaza and enforce civil law. Hamas has also taken an active role in preventing Gaza residents from entering the no-man’s zone near the Gaza security barrier, as per the understandings reached at the end of Operation Pillar of Defense. Egypt has been investing in maintaining the peace as well. Egyptian soldiers have taken pains to prevent weapons and other unauthorized items from reaching Gaza, and even arrested a senior weapons dealer recently. The weapons dealer was released after Gaza terrorist leaders gave guarantees that he would abide by Egyptian regulations. Egypt has also been cooperating with Israel, and two senior Egyptian military commanders recently visited southern Israel to speak to their IDF counterparts about the situation in the region. 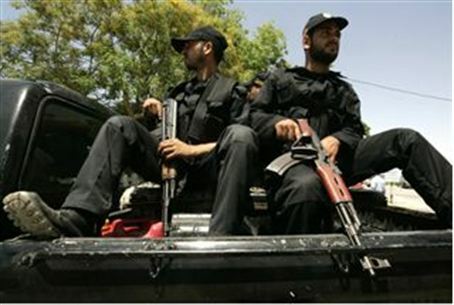 Egypt has a strong interest in controlling terrorism in Gaza due to its desire to maintain quiet in the nearby Sinai. Gaza terrorists have previously launched attacks against Israel from Sinai, and some groups have launched attacks targeting Egyptian soldiers.